Goats are goofy, fun-loving animals with a surprising amount of personality. Many people keep goats as pets for the entertainment factor, though they can also be raised as a source of food and dairy. If you’ve ever thought about raising goats yourself, here’s what you need to know before you get started. Before you even think about bringing your first goat home, you need to set up a space for them to live. You don’t necessarily need a great deal of space, but you do need to provide enough space for them to play as well as a shed or shelter to sleep in at night. You’ll need to clean up the area, fence it in, and prepare your shed. 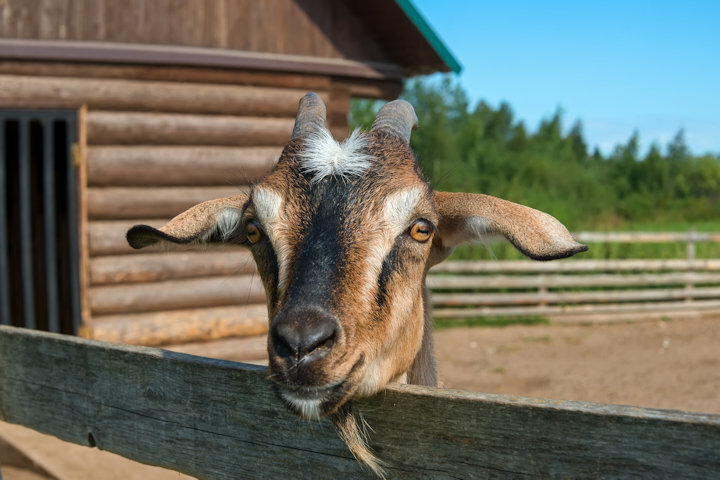 Make sure the fence is strong and sturdy – goats can be persistent about getting through a fence if they want what’s on the other side. Goats are herbivores, so they’ll spend much of their day grazing. To ensure that your goats’ nutritional needs are met, however, you’ll also need to provide them with good-quality hay like alfalfa. If you have enough land for your goats to graze and forage, you may only need to provide them with hay when they are in the shelter. You may also need to supplement your goats’ diets with vitamins and minerals. Don’t forget about water, either – goats need constant access to fresh water. Your goats are at risk for disease just like any animal, so you should familiarize yourself with some of the conditions that tend to affect goats so you can catch them early. One thing to be particularly concerned about is worms. Dosing your goats with an herbal dewormer once a week or using a chemical dewormer under your veterinarian’s guidance can help protect them. In addition to keeping your goats healthy, you’ll need to take care of their hooves as well with regular trimming. Talk to your veterinarian about how often your goats need to have their hooves trimmed and to learn how to do it. Many people don’t realize that goats are very active, intelligent animals. Providing your goats with space to graze is great, but you should also give them some toys and surfaces to climb on. You can create a goat obstacle course or playground using things like slides, seesaws, bridges, and more. Don’t be afraid to get creative with pieces of scrap wood, pallets, old tires, and the like. Goats will also play with large toys like balls and buckets – they love to toss them around. Raising goats can be a lot of fun, but you do need to keep in mind that you are responsible for caring for these animals. Take what you’ve learned here to get started with keeping goats but be sure to do your own research so you can provide for all of their needs.